You know you work too much when… – Gould Design, Inc.
As a business owner, I find myself working at night, during the day, even having work-related dreams! You never know when that inspirational thought or idea will come to you. When it does, we have to act fast and write it down, or call a colleague to bounce it off of them. Sometime this can be a strain on the family – the faithful wife and the lovable children. 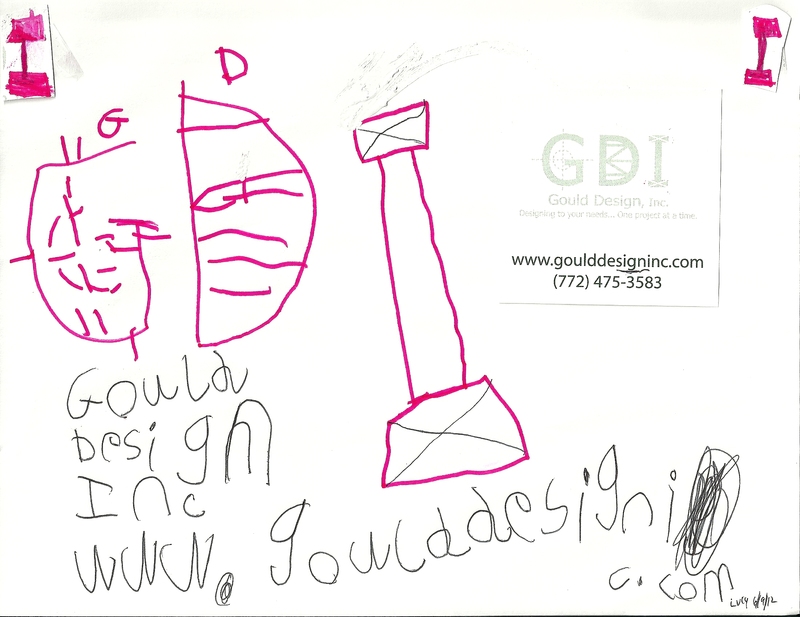 Yes, I was flattered that my 5 year old daughter did such a great job mirroring my company’s logo. But honestly, it kind of scared me. Do we as business owners really work that much that our young children notice to this degree? Are we taking away too much valuable family time, detaching ourselves from their one-and-only-childhood, by accepting that phone call, text message or video conference? Yes, our intention is to provide for them, to secure their future. But, you know what? They don’t really know that is what we are doing. All they know is that we are somewhere else in our mind, even though we may be right in front of them with our body. This was a real eye-opener for me. I don’t know about you, but I intend to be present in the moment when in the company of my family. That phone call or text message can wait. After all, aren’t I working to provide for them? The least I can do is provide them with my attention! It looks like your daughter is as proud of GDI as you are. I love working on computers, and designing. I first started drafting homes, for a modular manufacturer in 1985. I have been using AutoCAD LT to design and draft homes since 2004. A lot of my life was spent building. My construction experience started back in the early 70s before high school. In 1996 I had back surgery, so I started working in lumber sales. The back got better, so I started building again. In 2004 I was offered and took a position with a lumber yard, in their engineering department, designing floor and roof systems using EWP and trusses. I loved it. It was the greatest job I ever had, then in 2007, the economy was faltering, and for the first time in my life, I found myself laid off. Now I’ve been recovering from a cardiomyopathy discovered a couple of years ago, and working part time on the sales counter again. I’m still designing and drafting on the side. I’ve been married thirty years. I have two grown sons, two young adopted sons, and three grand daughters. My dream is to live in Florida for maybe four months out of the year to escape the winters here. Thanks for the kind words! I appreciate it. I also want to thank you for your feedback. Please heal fast! Have an outstanding day.